Anyone who has been following the news lately could tell you that we humans could do a better job of taking care of our planet. Perhaps you’ve seen reports about the Great Pacific Garbage Patch – a floating raft of debris in the Pacific Ocean twice the size of Texas. Or maybe you’ve read that plastic fibers have been found in the tummies of creatures in the deepest parts of the ocean. The need for recyclable, degradable, and sustainable materials has never been more urgent. Nashville Wraps’ Green Way® brand was created 10 years ago to make recycled, degradable, natural or sustainable packaging readily available to our customers – and to make it beautiful! Many of our eco-friendly products are so stylish, you might not even know they are eco-friendly. While we’re proud to be able to offer eco-friendly packaging, we think it’s even more important to increase awareness to help reduce waste. We think Earth Day should be every day! If we paid more attention to the amount of waste we were creating and increased our efforts to reduce waste and recycle whenever possible, what a difference it would make! 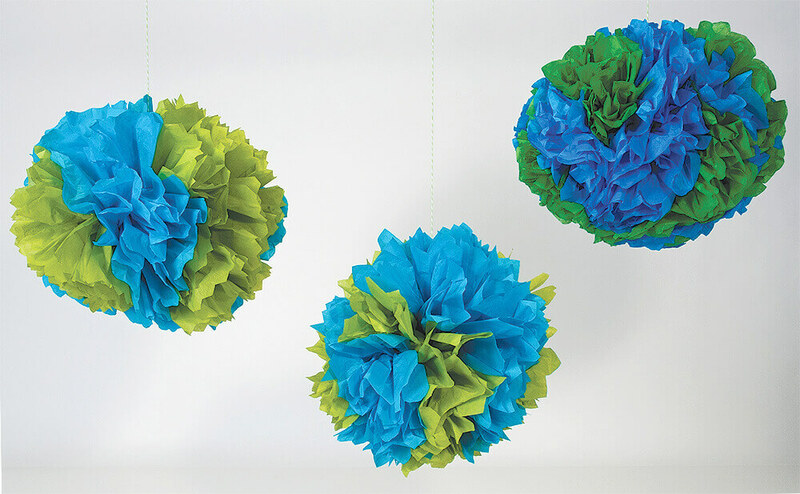 As a reminder to always be kind to the Earth, create one (or several) of these Earth Tissue Pom Poms to hang in your shop! Perfect for Earth Day or any time of year! Watch the video below to see how easy they are to make. Use our high-quality recycled 20 x 30″ green and blue tissue. I like Turquoise combined with Oasis Green, or Brilliant Blue combined with Festive Green, but you can use any combination that appeals to you! How has your business tried to reduce waste? Let us know in the comments below!